Make a professional impression on guests at your events, meetings, parties and more with this pack of 50 folding tent cards. The name tent cards are constructed from professional-grade heavyweight cardstock made to stand up to frequent folding, making them perfect to use as tented place cards, on buffets or as information cards at trade shows, farmers markets or boutiques. Featuring a subtly embossed frame and micro-perforations for quick and easy separation, these large tent cards are pre-scored so you can easily fold them and deliver event communications in a polished, professional way. 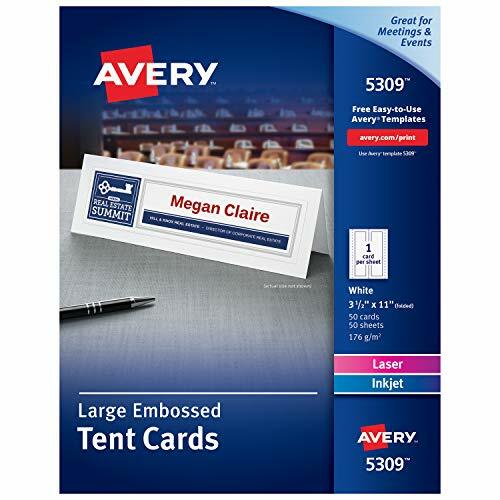 The blank tent cards are a wonderful canvas for you to personalize with your own unique designs, or choose from the thousands of free templates and designs at avery.com/templates for easy customization. You can add bold text and vibrant graphics to both sides of these tent place cards, and then print them out on your laser or inkjet printer without any smudges or jams. Save time and money without sacrificing quality using these 3.5 x 11 table tent cards to lend a special personalized touch to all your events. Optimized for laser & inkjet printers for jam & smudge-free performance, guaranteed. Add sharp text and vivid graphics to both sides of your tent card.